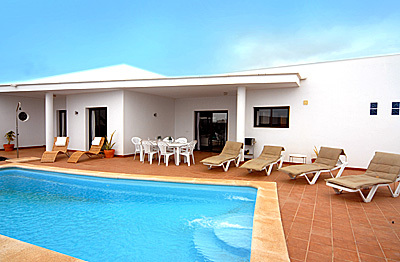 Villa Midori is a four bedroom three bathroom villa situated in the Playa Blanca resort of Lanzarote. It is in walking distance of Playa Flamingo (about 2km), which is a gently sloping beach, popular with families with young children. The unspoilt beaches of Playa Papagayo are a short drive away and Rubicon Marina is only a 10 minute drive. Outside the villa has a private heated pool surrounded by sun loungers, as well as an alfresco dining area. There is also off street parking. The open plan living room is comfortably furnished with leather sofas and there are patio doors which lead out onto the terrace. The master bedroom has a double bed and an ensuite bathroom and also has patio doors leading out to the terrace. Bedroom 2 has twin beds with an ensuite bathroom and bedrooms 3 and 4 also have twin beds and share a family bathroom.